Watch out – cusp ahead! Prepare for a shift in energies on Friday 20 January, as hardworking Capricorn makes way for humanitarian Aquarius. As the seasons change, we learn to care about a greater good, not only our own interests. More about that in my post later this week, though! For now, you need to know this: on Thursday 19 January, fierce Mars in idealistic Pisces locks into a tense square with sombre Saturn in honest-to-a-fault Sagittarius. Capricorn Season 2017 is going out with a bang and a clash – of wills, opinions, and personalities! But as always, folks, we have nothing to fear. Work with Universal energies for the greatest and highest good, and things will turn out just fine. Channel the energetic tensions between combative warrior Mars and stern taskmaster Saturn into an honest, objective reflection of who you are and what you stand for. What is your truth? How do you live it? Which of your ideals are really just pure fantasy – or can your dreams afford to grow a little bigger? You can’t control the actions and attitudes of other people, but you can direct your own. Avoid drama with people who insist they’re right – get your own act together because Universal energies are getting ready for take-off. Above all, be kind to one another, and don’t judge: getting all judgmental and holier-than-thou is a Capricornian shadow tendency and dahling, Capricorn is so last season – it will be by this Friday 20 January, anyway! LEFT: THE FOOL REVERSED. When upright, The Fool heralds wonderful new beginnings. When reversed, either you’ve been feeling stuck – or you’ve rushed in where angels fear to tread, and now you’re paying the price for it. Either way, the promise of a fresh start now seems to be only an illusion. Do we now lose hope? MIDDLE: SEVEN OF PENTACLES. The Tarot’s answer to the above question: No – be patient. 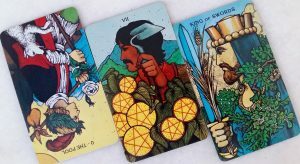 This card is known as the Lord of the Harvest: a farmer stands watch over the crops he has painstakingly planted and nurtured over months. The Universe runs on certain Spiritual Laws, and the Law of Karma ensures that you will receive the outcomes of your actions in time. Bear in mind that the crop you harvest will correspond with the seed you planted. A healthy diet and exercise regime will boost your physical wellbeing and trim your waistline; sleeping with your best friend’s spouse will earn you paranoia and maybe an STD. Your future outcomes depend on your actions now. Be honest with your intentions – what do you want out of life? So be wise. Whatever seeds you chose to sow, may they be for your greatest good. Wait for the harvest. And if you’re regretting the seeds you sowed earlier (as The Fool in reverse might indicate), go ahead and uproot, re-plant, then wait again. RIGHT: KING OF SWORDS. In line with the call to honesty and living in your truth, the King of Swords appears as the Tarot’s advice to us this week. His calm, clear gaze encourages us to adopt the same keen perspective towards our lives, issues, and challenges; to cut through the fog of delusion; to gain mastery over our thought lives and inner selves. This King is not fazed by emotion or the trappings of ego. He directs his life and his Kingdom with clarity, logic, and impartiality. May the wisdom of the King of Swords assist you as you navigate this week.